Strawberries, blueberries, raspberries and blackberries are just some of the small fruits used in this Best Ever Berry Summer Crostata Recipe. The perfect fruity dessert to end your summer meal! You’re probably wondering what makes this particular recipe the “best ever” fruit crostata recipe. If I were you, I would probably have those very same thoughts. Let’s see if I can convince you that this recipe is, in fact, the best ever crostata recipe. Let me begin by saying that this is a great recipe to showcase the wonderful small fruits available at your farmers’ market during the berry season this summer. Buying local and in season is important for so many reasons. For starters, local usually means more affordable. It also means that the crops are probably fresher since the time of harvest is closer to consumer availability and consumption of the produce. As a result, the produce probably has a higher nutritional value and far less contaminates. This reduction in travelling time is also great for the environment. Another point in my “best ever” case is that this recipe is super simple to put together. By definition, a crostata, which can be sweet or savory, is simply a free form, rustic looking pie, baked on a baking sheet. Free form generally implies no pans; it also (usually) means no fancy lattice top and no crimping. 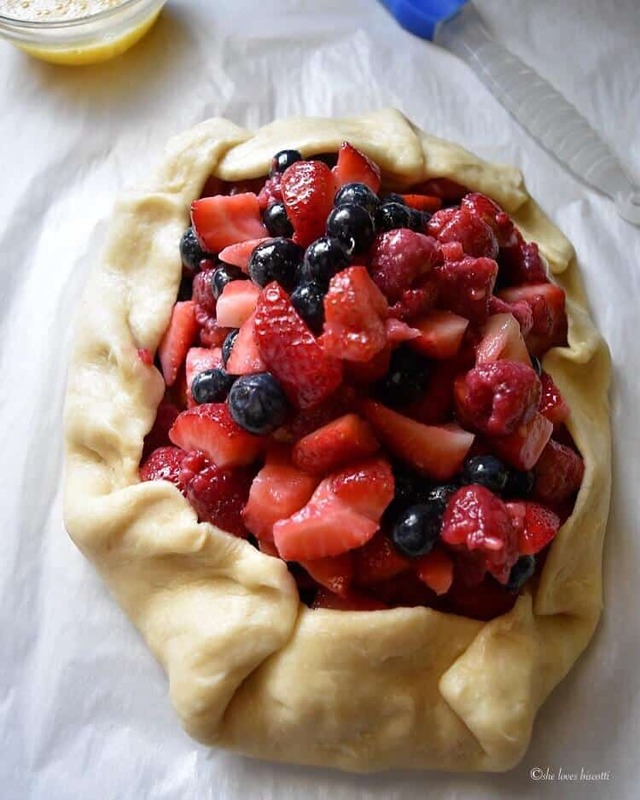 This open face pie is perfect because today, we are going to be filling it up with lots of small fresh fruits, in particular strawberries blueberries and raspberries. What’s the differenece between galette, crostata and a tart? In case you are wondering, galette and crostata are interchangeable terms when making reference to this rustic dessert. One is the French term and the latter is Italian. A tart, on the other hand, has a particular shape, whether round, rectangular or square. It is baked in a pan with a removable bottom so that when unmolded, the pretty fluted sides are showcased. Here is an example of an Asparagus Ricotta Tart made with a polenta crust. Let me show you how easy it is to make the “best ever” crostata or if you prefer this berry galette! Many, many years ago, Chef Michael Smith shared his secret on how to make the perfect biscuit -so glad I was watching that episode when it aired! I have simply applied his flawless method of grating frozen butter and gently incorporating it with the flour using my fingertips. Once the grated butter is worked into the flour, just sprinkle a tablespoon at a time of the egg yolk and ice water combination over a small section of the flour; toss together with a fork and push it aside. Add another tablespoon and repeat until you have used up all the liquid. Then, with your fingertips, gently knead the dough a few times and before you know it, you will have a ball of dough. I will then immediately place the dough between two pieces of parchment paper which have been lightly floured. Roll out the dough to an oval approximately 16 x 12 inches. Once again, this is a rustic pie, so any lopsided shape works. Transfer the parchment with the rolled out dough directly on the baking sheet. Set aside while we prepare the fruit filling. In a bowl, simply toss about 4 cups of your favorite small fruits with a little bit of sugar and cornstarch. Pile it up in the middle of your stretched out dough, leaving at least 2 inches all around. Just in case you are wondering, you can use any combination of strawberries, blueberries, raspberries or even blackberries… whatever fresh berries you have that are available. Can frozen berries be used in this crostata recipe? continue to assemble the crostata as outlined below using the cooled down cooked fruit filling. (Note: total baking time will be reduced as filling is already cooked). The next step is to bring up the sides of the dough and partially fold it over the filling. This step is easy if you use the parchment paper and gently push and fold the dough onto the fruit filling. Remember, there is no right shape for the crostata. A brushing of egg wash followed by a little sprinkle of coarse sugar and your crostata is ready for the oven. Easy, right? While the crostata is baking, you can prepare the berry topper. Essentially, this consists of more fresh fruit which has been macerated. If you recall, we talked about this process in this post about Macerated Strawberries. NUTRITION TRIVIA: It truly is hard to resist the bright colors of these small fruits -no Photoshop application required. As a general rule, the vibrant colors are due to a type of pigment called flavanoids. Not only are they beautiful to look at, but they are nutritional powerhouses. As you know, flavonoids are best known for their antioxidant health benefits. So, the next time you see that deep blue color of a blueberry, or the bright redness of a strawberry, know that when you consume them, you are well on your way to healthy eating! Once the crostata is baked and ready to serve, just spoon the berry topper over the cooked fruit. Garnish with some mint leaves and you have just made the Best Ever Triple Berry Summer Crostata Recipe. A few years ago, I bought a magazine from Better Homes and Gardens called “Cook’s Secrets”. I’ve adapted one of the recipes found in this publication. If you recall, these Perfect Hash Brown Potatoes was another recipe I adapted from this magazine. As in most recipes that I try out, I decreased the amount of sugar as I felt that the local Quebec strawberries I used in this recipe were perfectly sweet. Feel free to adapt the level of added sugar to the natural sweetness of the berries you are using. This Best Ever Berry Summer Crostata Recipe is definitely a show-stopping dessert that has the ability to wow your guests before even tasting it. Have I convinced you that this is the best ever crostata? If you have made this Crostata Recipe, I would love to hear about it in the comments below and be sure to rate the recipe! This Best Ever Triple Berry Summer Crostata Recipe is definitely a show-stopping dessert that has the ability to wow your guests before even tasting it. Preheat the oven to 375℉. Position rack to middle. In a medium bowl, whisk together the flour, sugar, zest and salt. Using a cheese grater, grate frozen butter over dry ingredients. Toss gently (with fingers) to incorporate the butter. In a small bowl, whisk together the ice cold water and egg yolk. Sprinkle one tablespoon of egg yolk-water mixture over a small section of the dry ingredients.. Incorporate together with a fork and push it aside. Add another tablespoon and repeat until you have used up all the liquid. Gently knead the dough (with your fingertips) a few times and before you know it, you will have a ball of dough. Place the ball of dough between two pieces of parchment paper which have been lightly floured. Roll out the dough to an oval approximately 16 x 12 inches. In a small bowl, whisk together the sugar and cornstarch. In a medium bowl, simply toss about 4 cups of your favorite small fruits with the sugar and cornstarch mixture. Add the lemon zest and toss until combined. 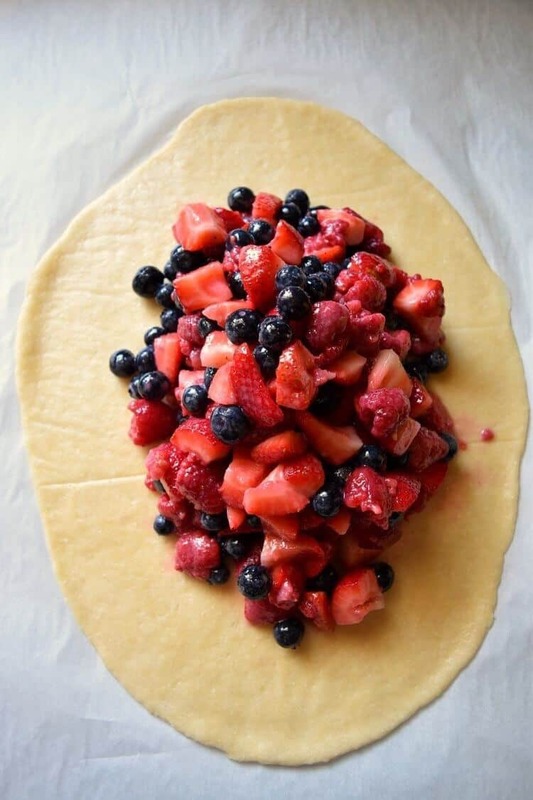 Pile the fruit in the middle of your stretched out dough, leaving at least 2 inches all around. Bring up the sides of the dough and partially fold it over the filling. Leave the middle of the crostata open. Beat the egg and water together and brush over the exposed dough. Sprinkle coarse sugar over egg washed crust. Place a sheet of foil over the berry filling and continue to bake for another 20 minutes or until the filling is bubbly and the crust becomes golden brown. Cool the crostata on the baking sheet which had been placed on a cooling rack. While the crostata is baking, prepare the berry topper. In a small bowl, combine the mixed small fruit with granulated sugar and lemon juice. Let stand at room temperature for at least 1 hour. When ready to serve, spoon berry topper over cooked center fruit filling of the crostata. Garnish with mint leaves (optional). Variation: If using frozen berries, simply use equal amounts of frozen berries (no need to thaw). Place in a small pan and cook over medium heat together for a 3-5 minutes. Add the cornstarch mixture and increase the heat to medium high. Allow the mixture to come to a full boil and cook for about 1 minute while stirring consistently. Remove fruit mixture from the heat, transfer to a bowl and allow to cool down completely. Continue to assemble crostata as per directions. Please note that the total baking time will vary as the fruit filling is already cooked. Once the crust is golden brown, your crostata is ready. DO YOU LOVE THIS CROSTATA RECIPE? Your site got me motivated :)) I baked ziti, made roasted sweet peppers, bruschetta, fried zucchini and crostata with strawberries and blueberries 😉 Phew! Carissima, so happy to find you ! Great works you do ! Will be back for more ! Ciao ! Grazie mille ♥ Welcome !! !